I have dug out my old Letts Boy Scout Diary for that year, where I noted that the Field Day was on Wednesday, 27 March 1963, when we basically practiced the march past and the exercise for the following week. This photo seems to be from that afternoon. I’m on the left, and I’m not sure who the other two are, though I certainly recognize their faces! 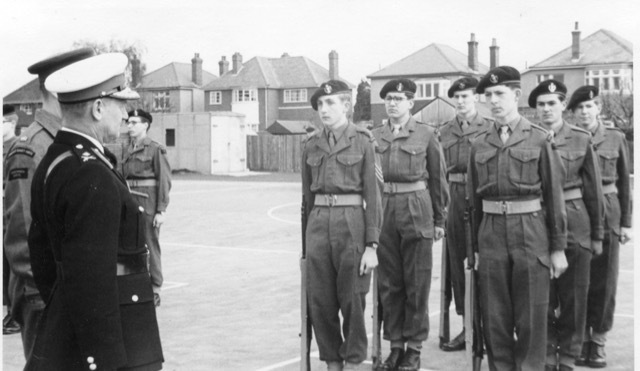 On Thursday, 4 April 1963, the Annual Inspection took place. This photo was taken in the morning, with the inspecting officer, Major-General Houton on the left, obscuring C/O R.D.F Williams. This is at the bottom of the school playing fields by Bournemouth School for Girls. The boys here are from left to right: Shelley (as Sergeant), Doug Hutcheson, Geoffrey Giles, Chris Kirkham, ?, and Mike Wooldridge. That afternoon the whole corps went out to Barnsfield Heath for a mock battle, which my old Ordnance Survey map of Bournemouth reveals is just north of Hurn Airport. 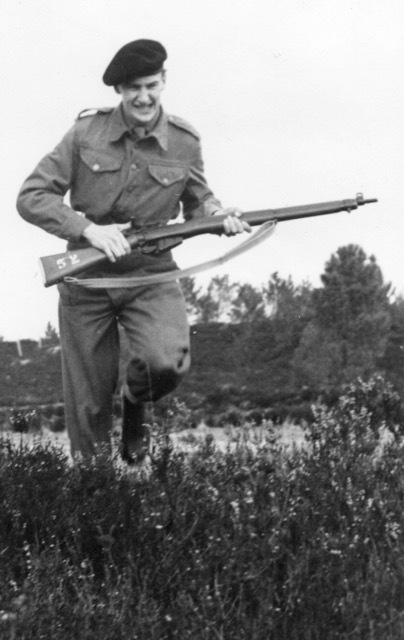 I seem to remember that my rifle jammed after the first shot or two, to my great annoyance. 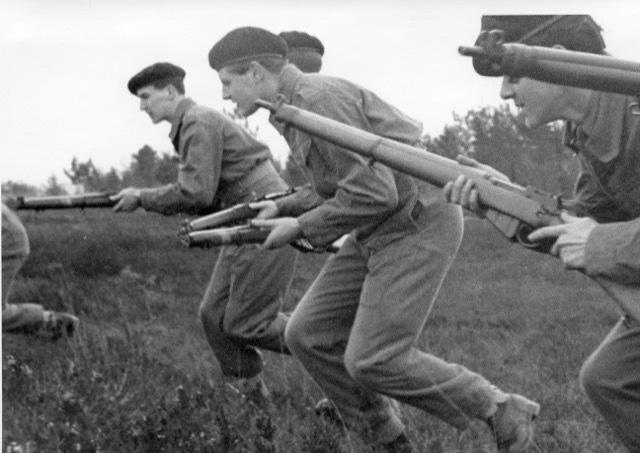 My diary reveals that we also had some instruction with a bren gun. Here I am charging the enemy! I hope my other contemporaries will have some fun, seeing these photos. This entry was posted in CCF by Ian Westhead. Bookmark the permalink.